Secondly, I wanted to enter a project on today's Whimsical Wednesday post at The Memory Nest blog. I learned of Leslie and The Memory Nest through Twitter; she has a great blog and online store. If you are looking for some challenges, she has a color and a sketch challenge posted right now at her blog. "Did we catch you in the act?" I used all three patterned papers, with the reverse of the small dotted paper, which was this blue background. I used orange Basic Grey letters from the Fact and Fiction collection and punched the hearts out of Fiction paper. I used Doodlebug twine to make the stitches (albeit, messy stitches) along the side. ﻿It only took me about 30 minutes to complete this layout; I like the simplicity of it, and it's another one for the book. 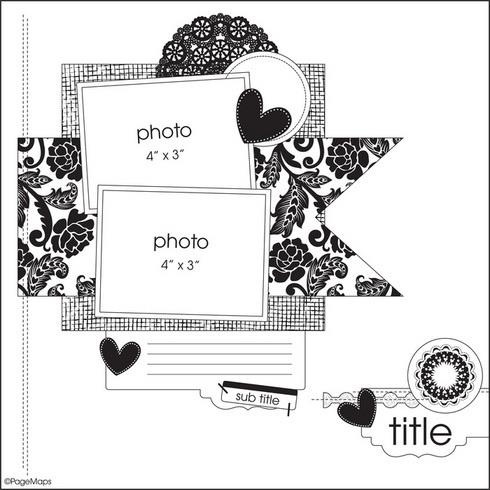 Hopefully you can take this sketch and use it to do your own layout today. Let's get some of those photos scrapped! Very fun layout. I like how you added the stitching and the button with the thread tide through it. Fun layout! I love how many different patterned papers you used. Been looking around your site and you have made some lovely things. As a new follower I look forward to keeping up with your creations. What a great page! I love how combined all these patterns and I adore that big banner piece you created! Great job! Scrapbook Process: Crazy Hair Day! Scrapbook Process: Boy Pages with a Lime "Twist"